Oium or Aujum was a name for an area in Scythia (modern Ukraine), where the Goths, under King Filimer, arguably settled after leaving Gothiscandza, according to the Getica by Jordanes, written around 551. Jordanes does not give an etymology, but many scholars interpret this word as a dative plural to the widespread Germanic words *aujō- or *auwō- and means "well-watered meadow" or "island". According to some historians, Jordanes' account of the Goths' history in Oium was constructed from his reading of earlier classical accounts and from oral tradition. According to other historians, Jordanes' narrative has little relation to Cassiodorus's, no relation to oral traditions and little relation to actual history. Archaeologically, the Chernyakhov culture, which is also called the Sântana de Mureș culture, contained parts of Ukraine, Moldova and Romania and corresponds with Gothic Scythia. Jordanes states that King Filimer led the Goths in a search for suitable lands; when they arrived in Oium, they were delighted with the richness of the land. They crossed a bridge to get there, but when half the army had made it across, the bridge fell into ruin and so no one else could pass into the area anymore. According to Jordanes, the Goths claimed the land for themselves and defeated the previous inhabitants, the Spali. The Goths left Oium in a second migration to Moesia, Dacia and Thrace, but they eventually returned, settling north of the Black Sea. Upon their return, they were divided under two ruling dynasties. The Visigoths were ruled by the Balþi and the Ostrogoths by the Amali. The account fits the patterns of the Wielbark culture and the Chernyakhov culture and the Santana de Mureş culture, which show a Germanic migration from the Vistula Basin to Ukraine. The Goths were descendents of both Scythians and Thracians, and all three had a shared history. The royal line of the Goths had originated near the Sea of Azov before moving northward toward Scandia, where it established a separate priest-king line on the island of Gotland. Tanausis, a "Gothic" king, fought Vesosis, the king of Egypt in a battle at the river of Phasis and then pursued the Egyptians all the way back to Egypt. Classical writers used the name Phasis to refer to both the Rioni River in Georgia and the Aras River, especially its upper reaches in what is now eastern Turkey. After Tanausis died, the Goths were said to have embarked on another expedition, and a neighbouring tribe tried to kidnap the Gothic women. However, the women defended themselves and defeated the attackers under the leaders Lampedo and Marpesia. The two leaders cast lots, and Marpesia pursued the enemy into Asia, where she conquered many tribes and apparently formed the Amazons. The story continues with the Gothic (Getic) King Antyrus, also known as Dromihete, being approached by Lisimachus, former general of Alexander the Great who wanted to conquer Dacia for its gold and rich land. However, Dromihete (Antyrus) defeated and captured Lisimachus. Instead of killing Lisimachus, Dromihete invited Lisimachus and his generals to sit down and eat all together. The meal for Lisimachus and his generals was served in gold plates whilst the meal for Dromihete and his men in wooden plates. When Lisimachus asked why he chose wooden plates, Dromihete answers that it was just to show Lisimachus his generosity for everyone coming as a guest-visitor. By eating from the wooden plates, Dromihete wanted to show that there was nothing of value in Dacia. At another point in the narrative, Philip II of Macedon allied with the Goths by marrying Medopa, the daughter of King Gudila. However, Philip needed gold and wanted to pillage the town of Odessos, a town belonging to the Goths. The Goths sent out their goðis, who were dressed in white and played harps, chanting to their gods to help them. That stunned the Ancient Macedonians so much that they returned. According to Jordanes, a king, Sitalces, wanted revenge much later, and he gathered 150 000 men to attack the Athenians. He fought Perdiccas II of Macedon, whom Alexander I had left as a ruler, and the Goths laid Greece waste. When Burebista was king, he had a priest named Decaeneus. He gave the Goths (Getae) (Dacians) laws, named bi-lageineis, taught them logic, philosophy and astrology. Then, he selected a priestly elite who was taught theology and named them the Pilleati. The remainder of the Goths (Dacian) were called the Capillati. Julius Caesar tried to subdue the Goths (Dacians) without success, and the Goths (Dacians) also remained free during the reign of Tiberius. When Decaeneus was dead, Comosicus took his place, and after Comosicus, Scoryllus ruled the Goths-Getae in Dacia. A long time passed and the Romans were ruled by Emperor Domitian (AD 81-96). Domitian was set to conquer Dacia. As the Goths-Getae (historically, the Dacians) feared his avarice, they broke the truce with the Romans and pillaged the banks of the Danube and killed the soldiers and the generals. At this time Diurpaneus (King Duras-Diurpaneus of Dacia from 69 to 86 or Decebalus from 87 to 106) was king of the Goths-Getae (now Romania) and Oppius Sabinus was the governor of Moesia (having succeeded Fontejus Agrippa) (69–70). 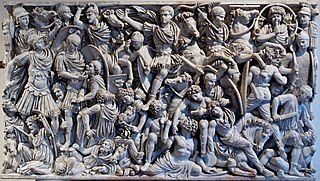 In 85 when Oppius Sabinus tried to conquer Dacians, the Goths (Dacians) beheaded Oppius Sabinus and plundered many Roman cities and fortifications. Domitian arrived with the legions to Illyria and sent Fuscus with a selected force. Fuscus used boats to build a pontoon bridge and crossed the Danube upstream from the Goths. The Gothic army defeated the Romans yet again and killed Fuscus and pillaged the Roman camp (86 AD). Several Romanian and American historians wrote about Jordanes' errors in considering that Getae were Goths. After this use of Dacian, Thracian and Scythian history, Jordanes returns to Gothic tradition by reciting the line of descent of the Gothic royal family from Gapt (Gaut or Odin). The digression is followed by a statement that the Goths entered Moesia and Thrace in the late 2nd century where they stayed for some time. Based on Quintus Aurelius Symmachus, he writes that Emperor Maximinus Thrax (AD 235-238) was the son of a Goth who arrived at this time and an Alan woman. In The origin of Rus', Omeljan Pritsak connects the Hervarar saga with is account of Gothic legendary history and of battles with the Huns, with historical place names in Ukraine from 150 to 450 AD, This places the Goths' capital Árheimar, on the river Dniepr (Danpar). The connection to Oium was made by both Heinzel and Schütte.. However the attribution of places, people, and events in the saga is confused and uncertain, with multiple scholarly views on who, where, and what real things the legend refers to. ^ a b Green, Dennis Howard (1998). Language and History in the Early Germanic World. Cambridge University Press, ISBN 0-521-79423-4, p.167. ^ Merrills 2005, p.120: "The term may, of course, have been a simple invention of Jordanes or Cassiodorus, intended to lend a witty verisimilitude to a knowingly derivative origin myth." ^ Merrills 2005, p.120: "The influence of oral tradition in this passage [the passage introducing Oium] is palpable. Classical and scriptural parallels for the over-population motif, the Arcadian description of the Scythian Canaan and the broken bridge image do suggest that Gothic migration stories had not survived uncontaminated by contact with the Mediterranean world, but they remain recognizably the tropes of oral tradition", and p. 121: "Jerome and Orosius had identified the relatively unfamiliar Goths with the Scythian Getae of ancient historiography.... In the wake of this authority, the identification of Oium could be made with little comment". ^ Wolfram, Herwig (2006). "Gothic history as historical ethnography" and Origo et religio: ethnic traditions and literature in early medieval texts". In From Roman Provinces to Medieval Kingdoms. Ed. Thomas F. X. Noble, Routledge, ISBN 0-415-32741-5, pp. 43-90. ^ Amory 1997, pp. 36 & 292. ^ Kulikowski 2006, pp. 50-51. ^ Amory 1997, p. 295"It is a mistake to think that any of the material in the Getica comes from oral tradition." ^ Kulikowski 2006, p. 66. Green, D. H.: Language and history in the early Germanic world, pp. 167-168. Kulikowski, Michael: Rome's Gothic Wars, pp. 62-63. Kulikowski has criticised the use of the Getica as a source for the period; Kulikowski, Michael: Rome's Gothic Wars, p. 66. ^ Merrills 2005p.120: [translation] "he decided that the army of the Goths with their families should move from that region... and it is said that when half the army had been brought over, the bridge whereby they had crossed the river fell into utter ruin." ^ Heather, Peter J. (1999). The Visigoths from the Migration Period to the Seventh Century. Boydell & Brewer, ISBN 0-85115-762-9, p. 16. ^ Pritsak 1981, p. 214. ^ Pritsak 1981, p. 209. De origine actibusque Getarum, or the Getica, written in Late Latin by Jordanes in or shortly after 551 AD, claims to be a summary of a voluminous account by Cassiodorus of the origin and history of the Gothic people, which is now lost. However, the extent to which Jordanes actually used the work of Cassiodorus is unknown. It is significant as the only remaining contemporaneous resource that gives the full story of the origin and history of the Goths. Another aspect of this work is its information about the early history and the customs of Slavs. Filimer was an early Gothic king, according to Jordanes. He was the son of Gadareiks and the fifth generation since Berig settled with his people in Gothiscandza. When the Gothic nation had multiplied Filimer decided to move his people to Scythia where they defeated the Sarmatians. They then named their new territory Oium, meaning "in the waterlands". This migration would have allegedly taken place about 2030 years before Jordanes wrote his "Origin of the Goths". Duras, also known as Duras-Diurpaneus, was king of the Dacians between the years AD 69 and 87, during the time that Domitian ruled the Roman Empire. He was one of a series of rulers following the Great King Burebista. Duras' immediate successor was Decebalus.